The maintenance service our team can offer you is a great way for you to make sure your automatic garage door is able to keep functioning for a long time. The stress its various components are under on a daily basis makes regular servicing an absolute must if your goal is to keep the system in an optimal condition. One of the main focuses of our service appointments is to make sure the system is safe to use. We make sure of that through several means, a major one of them is checking the photo-electric sensors installed at the lower sides of your garage's opening. If these sensors are misaligned, they won't be able to properly detect an obstacle. That means the door won't reverse while you or any of your family members are standing under it. Obviously, this is very dangerous, which is why our technicians always check the position of the sensors and realign them as necessary. Your overhead garage door doesn't just move up and down on its own. Its rollers and springs are the parts that essentially move it along the tracks. A broken spring can cause the door to slam shut and be inoperable, while a worn out roller can potentially cause it to get stuck. A door that got off track or won't move up or down properly is not just annoying and extremely inconvenient, it's also incredibly dangerous. Our team will help you prevent this by lubricating these components and making sure their condition remains fully functional. The condition of the door itself is something some homeowners tend to neglect. Not willingly, of course. It's just something people tend to forget about, even though it's practically in front of their face every single day. If you have a wooden garage door then the panels must be inspected for rot. A steel door must also be examined to make sure no dents or rust have developed. If our technicians find evidence of serious damage, we'll replace the panels with matching ones that will keep your door's curb appeal. Preventing something is much easier and safer than dealing with the repercussion of neglect. 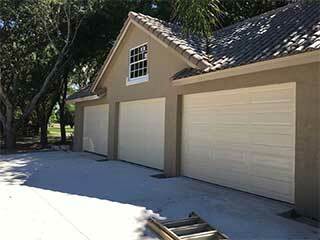 Call Garage Door Repair Loganville today to make sure your door stays in an excellent condition.